There are so many unspoken rules that a teacher needs to follow in order to make his or her students feel welcome, valuable, and safe. Most of my close interaction with students occurs in my two student assist periods. These small study halls have around between 7 and 12 students and are not your typical “study halls” where students work alone quietly. We study. We practice. We play games. We work together. We have a good relationship where everyone is comfortable and we get a lot accomplished. I give an extra quarter when someone doesn’t have enough money for breakfast. I notice when kids are hungry and I open up the snack cupboard. When we are having a good day, I tell them how nice it is to have a good day. When I’m disappointed or shocked at something they’ve done, I tell them. Every Friday, I ask students what they plan to do over the weekend and really listen. On the flip side, on Monday I ask them how their weekend was and really listen. If I see students outside of school, I just wave, say hi, or smile – but not all three so I don’t embarrass them – and then when we get back to school remind them, ask what they were doing and who they were with and really listen. I give students sticky notes to remind them to turn in missing work in their classes. Every single day in study hall, I go around the room and say, “Alex, what are you going to work on this period? Brandon, what are you going to work on this period? Chad, what are you going to work on this period?” and if they say “Nothing” I say “Wrong” and I remind them of what they need to be working on. When students miss a day (or two, or three) I seek them out in homeroom their first day back to check on them. I give them a brief rundown of what they missed and I let them know that during study hall we will set goals to get their missing work done. I am consistent and I don’t change the game midway through. They know the routine. I make sure students know my schedule and where to find me. They know if they need help they can come to me anytime. I don’t do anything for them, I do it with them or show them how, but I won’t do it and it doesn’t take them long to figure that out. It probably sounds like I’m too easy on them, or too nice, or more like their friend and maybe take too good of care of them by providing so much. Maybe it’s the mother in me, but I think I was like this before I became a mom too. In fact, in college, my roommates called me “Mother Mel.” For some students, this 50-minute study hall might be the most attention and meaningful interaction with adults they get all day. Usually, at the end of the day, I am exhausted. I give constantly and it takes a lot of energy. I do it all day long – nonstop – but it doesn’t feel like I’m not getting anything back in return. Know what I mean? 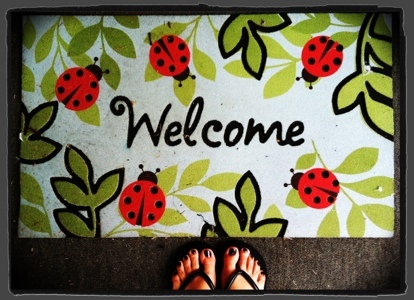 My “Welcome, Summer” mat at home. Nothing says “summer” like ladybugs and flip-flops! Great article. Every year when school is about to start and supplies go on sale, I remember that my own kids never had to school without the things they needed and wanted. So I always enjoy buying for your kids so they too can have at least the basic supplies. I’m glad you and the kids enjoy them. Thank you Aunt Sharon….For reading and for being so thoughtful. My kids know all about you! Love your thoughts. I will say, though, that #11 had me feeling a teensy bit guilty. I started off providing these items; however, with 60+ students, I was going through pencils like nobody’s business, so I started charging a quarter per pencil (easier to make change). I used the money I collected to buy more pencils. Sometimes, students would buy two or three. More often, though, another student would dig out a pencil for the student-in-need to use. What also happened was that the student asking would change his/her mind and magically “find” a writing utensil buried deep in the backpack. The kids learned to do for themselves. For ninth and tenth graders, that was a very good thing indeed. Thanks for reading and commenting!! And don’t feel guilty!! I have a third of the kids you do and many do not have the resources to buy school supplies. Plus my super awesome aunt buys me boxes of pencils and cap erasers and index cards every holiday! I also hit Office Max when they are selling packs of ten for a dime. I have a huge stockpile in my closet!